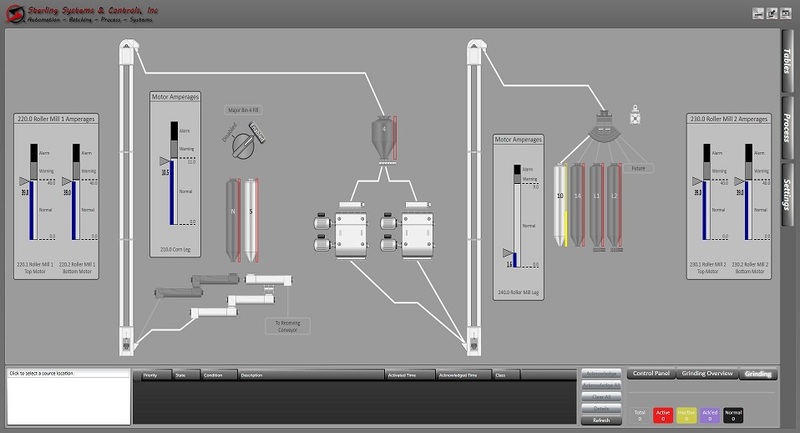 Sterling Systems & Controls introduces its automation application module for grinding of solids. Sterling Systems & Controls introduces its automation application module for grinding of solids, such as for grinding applications in feed mills. Grinders are known by many names/types, e.g. grinders, classifiers, hammermills, etc. All automation systems are custom engineered and manufactured to meet exact customer requirements. The grinding process increases process efficiency and improves conditioning in many production operations, such as in a feed mill. Grinding performs particle size reduction. Why? In feed production grinding creates more surface area, which aids in digestion of the feed. Fracturing of the solid material occurs in the grinding process, resulting in both an increase in material surface area and dissipation of heat. Whether you use a roller mill, a hammermill, or something else in your process, these automation and process control systems automatically optimize the grinder operation within the overall production process and automation system to meet specific size requirements. Example: adjusting gaps in roller mills to achieve a specific micron size. This also includes setting or programming the mill type, grinding rate, loss factor and source/destination ingredient, along with providing feeder speed control based on the type of material, type of grinding mill, and the transfer of the material to the next part of your production process. Benefits of the grinding application includes higher accuracy, reduced waste/contamination, runs automatically, keeps ground bins full. Sterling Systems & Controls Inc., Sterling, IL 815-625-0852 www.sterlingcontrols.com.